This page will guide you to resize partition on RAID 5 on Windows Server 2003 by using professional partition software. Download IM-Magic Partition Resizer Server to increase size of C partition data volume on RAID 5 in Windows Server 2003. It is terrible to run into low disk space problem on RAID 5 partition on Windows Server 2003 because there is no Windows built-in tool for partition resizing. You may need to rebuild the array in order to reallocate disk space on RAID 5. 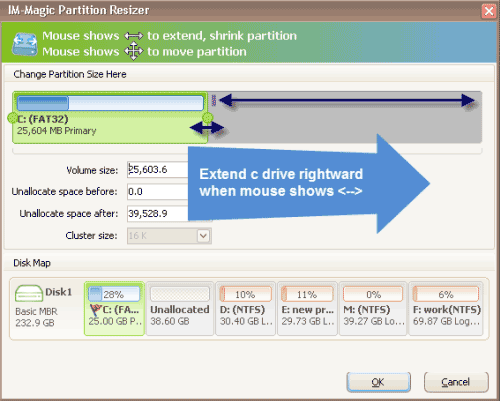 However, now you can use IM-Magic Partition Resizer Server to perform partition resizing. This partition software enables you to extend disk partition on RAID 5 without rebuilding array or touching any data on the array. This partition software can be compatible with almost all Windows Servers. Download, install and run IM-Magic Partition Resizer Server. Right click a partition on the RAID 5 array that has enough free space and choose "Resize/Move" option. You need to move the unallocated space close to the partition that has low disk space. Then, right click this partition and choose "Resize/Move" option. You can move the arrows to add the unallocated space to the selected partition and then click "Apply" button. "May I ask if it is possible to resize partition on RAID 5 under Windows Server 2003? The C drive is running on low disk space on the Windows Server 2003, but I do not want to rebuild the array to reallocate disk space. The array is created by 3 Seagate hard disks. There are two logical partitions on the RAID 5 array. 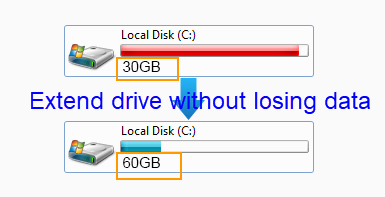 I am wondering if I can move some free space from other partition to the C drive without rebuilding array. Thanks for your help!" "There are two partitions on my RAID 5 on Windows Server 2003, but C drive only has little free space. The C drive has FAT32 file system and the other partition has NTFS file system. I tried to resize disk partition under Disk Management, but it seems like that there is no such a function on Windows Server 2003. Now, I want to look for a partition tool to resize the partition on RAID 5. Can anybody give me some help?" Why Receive Low Disk Space Alert? Usually, Windows pops up low disk space warning message when the free space of a partition is less than a certain digit or there is not enough free space to store the data you add. Windows system reports low disk space warning to ask you to delete files to free up disks space to prevent your PC from running into any trouble due to low disk space problem. When system partition is running out of disk space, it may affect the performance of your PC and make it run slower and slower. Even worse, it may cause unexpected disaster like blue screen or black screen on your computer. Why Select Partition Software for Partition Resizing on Windows 2003? The only Windows built-in tool that can extend a partition on Windows Server 2003 is Diskpart, but it is only able to extend a NTFS data volume when there is adjacent unallocated space. In other words, there is no Windows built-in utility on Windows Server 2003 to extend a system drive or FAT32 partition. Partition software has the ability to resize disk partition on RAID 5 without such kind of limitations. The partition software is able to shrink partition to squeeze unallocated space and extend both system partition and data partition without touching the operating system or any data stored on the array. The partition software can work on Windows Server 2003 to extend C drive system partition that has FAT32 file system. You can move some free space from other partition on the same array to get C drive extended. Or you can also add new disk to increase the size of C drive. By using the partition software, you don't need to backup data because it will not do any hurt to any data. If you need to add new disk to resize RAID 5 partition, you should make sure that the array can be compatible with the new added disk.